From birth up to 18 kgs.Group 0+/1. For baby's safety on the road, rent a car seat, group 0+/1 (0 - 18 kgs). Delivered and collected from you address, anwhere in France. Group 1 position: facing the road (for child between 9 and 18 kgs). Simple car seat belt installation with color coded guides. Suitable for children from birth up to 4-year old (18 kgs max). When returning car seat, please inform us of any impact or accident. Read Chicco Cosmos instructions here. See Chicco Cosmos installation video here. 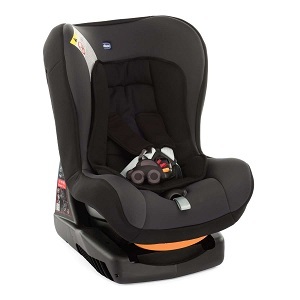 To select this product, we had 2 key criteria for our car seat hire: first is, of course, to provide you with a safe, European standards compliant model. Second one, is to be able to provide you with a simple to use car seat to rent. We know that you need to be able to install it safely in your car in few minutes only. And we're of course always available to provide advices if needed. Questions, regarding car seat rentals? don't hesitate to contact us. "This service was amazing! I was unsure how we would manage international travel with a large car seat and assortment of toys (as my son was already bringing lots of stuff). Camille was fantastic to work with and very accommodating with delivery and pick up of items. I would highly recommend this service if you are traveling to Paris." We loved everything about our experience with Baby'tems! The products were pristine and exactly what we had hoped for, and the customer service was incredible. Camille was responsive and extremely helpful and flexible to work with our timing and locations. When she dropped everything off, she took time to sit down and explain the products to me. Renting from Baby'tems gave us the trip we hoped for without the hassle of bringing everything from the U.S. or the stress of a poor product from the rental car company. We had complete peace of mind that all the products were safe and clean. They are a wonderful company that we will use any time we visit Paris! Babytems came recommended by a friend who lives in France and I was not disappointed. Camille was extremely helpful and responsive. Her delivery was prompt and she showed me how to set up the items I rented (carseat and playcrib). She even accommodated a very early pick up time to ensure that my family could catch our flight home. This service made our trip to Paris with a baby much more convenient. Merci beaucoup Camille!